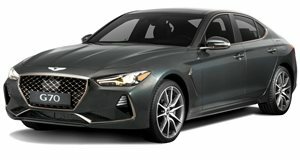 Since Hyundai spun the Genesis line off into its own brand, everything it's showcased – production or concept – has been rather large. Some taller than others, but hardly diminutive, at any rate. That changed today at the New York Auto Show, where Genesis revealed the Mint concept. Envisioned as an upscale electric city car, the Genesis Mint looks tiny. Just how tiny, the automaker hasn't said. But we'd be surprised if it was bigger than a Mini Cooper (and probably much lighter), with two doors, two seats, and overhangs barely extending beyond the wheel wells. The design is dominated by the brand's signature parabolic line, enveloping the vehicle's shape and up towards the rear. The lower half is characterized by a matrix pattern that both augments the vehicle's visual three-dimensionality and cools the underbody battery pack. Narrow LED strips extend to the outer edges of the front and rear fascias, and the whole thing's painted in a matte shade of Hunter Green (save for the semi-floating black roof). A pair of rear-hinged scissor doors provide access to the rear cargo compartment (instead of a traditional trunk lid or tailgate). And the minimalist interior complements the green paint with deep cognac leather and lightweight textiles. Inside there's a single bench seat for two, which swivels along with the instrument panel, as the armrest serving as center console folds up and out of the way. The wide steering wheel contains the display screen at its center and is surrounded by six more. And the matrix design theme continues over the floor and into the cargo bay. Power is provided by an all-electric powertrain, with only a few specifications disclosed: it's envisioned to provide 200 miles of range on a single charge, enabled by a 350-kW quick-charger.